I had bought the flight to München long before the trip, but other than a concert in München and another one in Berlin, I had no idea what places I would most want to visit. At the time I purchased my flight, I couldn’t have foreseen the trip being of any significance to me, for it was supposed to be just another normal, purposeless two-week trip that would be filled with pointless sightseeing and even more pointless souvenirs shopping. Yet weeks before departure, I received a dreadful news, which, at an instant, changed the nature of the journey from a leisurely endeavour to an escape from the sorrow of the time, like the protagonist in Schubert’s Winterreise, except the my journey didn’t happen during Germany’s harsh winter; not that I could choose when to go, of course. The flight to München began in midnight and lasted for some twelve hours, so that I would arrive at four or five in the morning, giving me ample time the next day; perhaps even too much time, for, being unable to sleep on any flights of that lengths, I arrived exhausted before going anywhere; and I had a serious problem with seats on planes, for I wasn’t (and still not) rich enough to fly first-class: those reclining chairs can never go all the way to a flat position where one can rest as we are used to in a bed; instead, I was forced into some awkward postures that tire me more than not sitting in it. It was the back-breaking posture more than the lack of any sleep that made the first day, or indeed, the first few days of any long trips, difficult, and the most stained part of my body wasn’t the legs, but my back. When I stepped out of Flughafen München, the air was almost cold—it was four or five in the morning, after all—but the weather was good, the sky was blue and cloudless. The sun wouldn’t come out for some time; in fact, it didn’t until I find my way around the Hauptbahnhof. I tried to look up the map of the main station before I flew, but that didn’t help me much. I ended up going from the underground level to the ground level, down again, and again for many more times before I knew how to get out. I explored the surrounding for a bit and found that it was too quiet to feel like a big city—having been a resident of London and Hong Kong gives one a different view of what a big city means from what a German thinks—and having not planned the trip very well, I wasn’t aware of the fact that Munich’s central station isn’t exactly the most “centtral” place of Munich: that would be Marienplatz and its vicinity. Quietness in the early hours of Munich and any other German cities was unsettling for mega-city dwellers, who are used to being surrounded by noise; so used to noise, in fact, that we are perhaps more inclined to feel vulnerable everywhere is empty and silent. And I did feel vulnerable in the beginning, as would anyone travelling to a new place for the first time, a place where people speak a language you don’t speak or don’t speak very well: I had some German lessons many year ago, and haven’t brushed it up prior to the trip. After some initial confusion, I found my bearing and set out to the first place I had long wanted to go: Dachau Concentration Camp. The history of the Second World War always fascinates me, especially in the European theatre. I am aware of the War in the Asian theatre, of course, which began earlier and ended later than the European one, and was no less brutal. My own home town was once subjected to the barbaric rule of Imperial Japan. Somehow, however, I have always been much more interested in the European War, and everything European, for that matter. It is hard to understand why a person like one thing instead of another, and the preference for that one thing cannot be explained by any rational reason. Other than learning Western classical music, there has been nothing particularly European in my upbringing; in fact, my parents couldn’t even speak English, let alone any other European languages, and they were culturally quite Chinese and collectivist, while my own nature was individualistic and rebellious, not in a sense of breaking laws, but in a sense of disregard of the convention and perpetual scepticism of the mainstream. When my friends at school were indulging in Japanese TV dramas and popular singers of the days, I was working my way through the keyboard, learning music by Beethoven, Bach, and Brahms, totally oblivion of the wind and tide of my time, as if I were living in one place but culturally in another place. But why the Second World War? Perhaps my affection for German classical music has left me wondering why the land of Beethoven could also produce the closest thing to a monster mankind has ever seen: Adolf Hitler. Beethoven, who supported Napoleon until the latter declared himself Emperor, would certainly hate an character as evil as Hitler, and he would not been able to conceal the hatred. Ironically, Beethoven’s ninth symphony has been used by regimes of all kinds for their own causes, noble and evil alike: the European Union’s anthem was taken from the last movement of Beethoven’s ninth, while Hitler’s birthdays were celebrated with performances of Beethoven’s ninth by the Berliner Philharmoniker, which, paradoxically, Hitler himself didn’t attend. Or perhaps even more controversially, Richard Wagner, the composer who wrote a notorious anti-Semitic essay, whose music Adolf Hitler adored, an adoration that I (and Marcel Proust) share, and whose family’s conduct during the Second World did nothing to lessen his tainted reputation, was undoubtedly one of the most important composers ever lived and had laid down the foundation for what would later become film music. There is, of course, no correlation between the greatness of one’s musical output and one’s personality and moral character, but why has the Germany-speaking nations produced so many great composers, artist, literary figures, and Adolf Hitler? 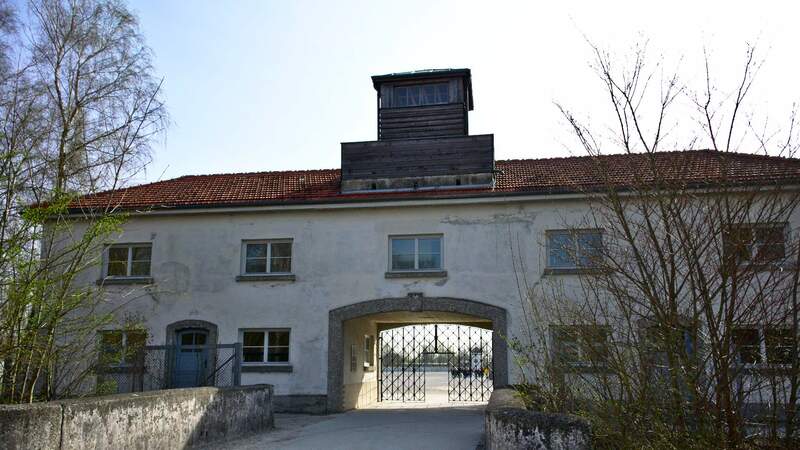 Dachau Concentration Camp was not a death camp in a sense that the purpose of its existence was to murder people, though it was the first of Nazi’s concentration camp, and death did happen there in massive numbers. At the far end corner of the camp, one could find a little house, which was the crematorium of the camp. The most striking thing wasn’t the death around the place, however, but the tranquility and the beauty of the area. On a fine day, such as the one when I was there, the sun would illuminate the whole of the cloudless sky, the blue hue of which would be rich and deep, birds would sing the tune of merriment, grasses would enjoy their sunbathing. But this is a scene of death and torture! The natural beauty there was so incongruous with death. In every relic of Nazi terror, whether it was Dachau concentration camp or Topography of Terror in Berlin, there were groups of school kids led by their teachers, who would explain to the kids what went on the places of doom; they would roam around the exhibitions, listening to their teachers’ and staff’s description of items on display, which could be letters from the Nazi authority ordering some killings, or photographs of some Jewish people or important dissidents, whose death were now commemorated in the places where they were killed. It was as if Germans are drilling the collective remorse for the sins of their distant forebears down into the skulls of their offspring, so that they will not forget those sins, and that they will keep on doing it for their offspring. For that, I found German people admirable. Human beings, after all, had a very weak ability to learn from history, as history unfolds in a pace and rhythm much slower and not synchronous with the moods of a collection of people who are making history for the future. Lessons learned from one generation are bound to be forgotten in the next, and more will be forgotten in the future generation. The lessons gained from the experience of one generation will, after a few generations, be accessible only to a very few motivated people who are keen to regain lost lessons. When that moment occurs, the warnings given by these learned people to those who are unaware of the repetitive nature of history would be unheeded, these well-intentioned students of the past would be ridiculed by the mass, and the destruction will once again descend upon the world after all the efforts to prevent it fail. On my way back out to the entrance of the Dachau memorial, a black cat was chasing, hunting, or playing with a little mouse. As a cat-owner myself, I was mildly amused, as did the kids who were waiting for their turn to enter the memorial site. It was noon by now, the sky was bright, and as I waited for the bus for Dachau Bahnhof, I noticed a Cherry Blossom tree on the other side of the road. There were house around the area, and people lived there. After going through the exhibition of gruesome brutality, the mood outside was in a stark contrast, but they were all under the same sky on such fine day. I went to Marienplatz late in the afternoon after checking into the hotel and had a little rest. Marienplatz is the city centre, and like so many other cities centres of Germany, it comprises of a public square and a town house (Rathaus) on the side of the square. 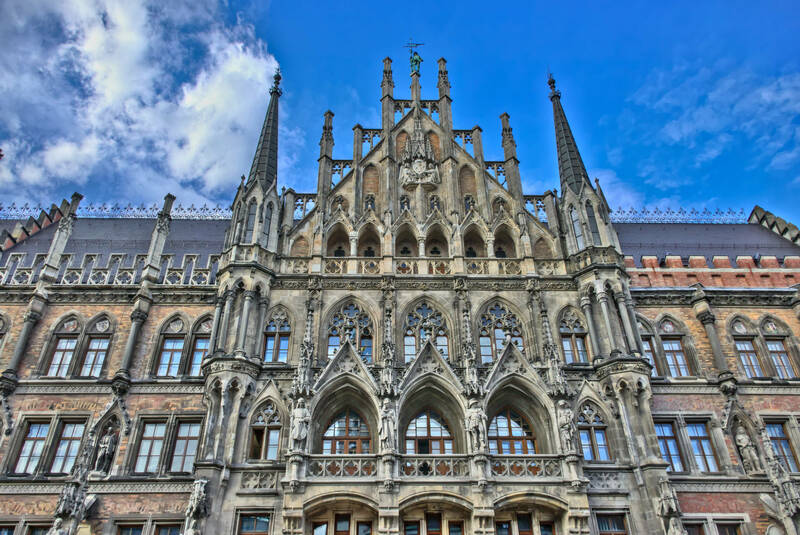 The Neues Rathaus of München is among the tallest building in München, only eclipsed by the towers of Frauenkirche. I remember Frauenkirche well, not because of its grandeur, which was dwarfed by other cathedrals (most notably Kölner Dom), but because of one small incident. I believe it was during an afternoon or evening mass when I made my entry. The mass was conducted in German; and being a non-believer myself, what the priest said from the pulpit was incomprehensible. The mass was drawing to a close, and people were rising from the benches, and they began shaking hands with the people nearby. Soon, a middle-aged local man looked me in the eyes with a smile and reached out to me with his hand; we shook hands, and I didn’t know why; an old lady then came forward to me an offer her hand too. What that was, I think I will never find out, but at that instance, I was rather moved by the offer of friendliness by two complete strangers. In the areas around Marienplatz, street musicians stationed outside shop windows of department stores, exits of U-Bahn, and random spots on the pedestrian-only streets. One little band with clarinet, bass, and accordion were playing lively Klezmer music just outside one of the exit of the Marienplatz U-Bahn, quite close to where I chose to have a traditional Bavarian dinner. A woman strolled by in front of the band and started dancing to the tune, the crowd watched with growing enthusiasm, clapping to the beats of the music, while the band played with increasing pace. The joyous atmosphere created by Jewish folk music at the heart of a big German city would be unimaginable to Hitler: Odeonplatz, where the Nazi marched through while they attempted to seize power in 1923 Beer Hall Putsch, was just two streets away from Marienplatz. In the Topography of Terrors in Berlin, I saw a photograph of some sort of Nazi parade in Odeonplatz just in front of the Feldherrnhalle. Perhaps because I grew up in a city where everything is new and every undemolished old thing is deemed inferior and irrelevant, the idea of walking through a street and still be reminded of its past is unknown to me. Knowing what I knew about the history of the Third Reich, walking around Odeonplatz would gave me uneasy feeling; knowing what I knew about the Berlin Wall, strolling through the East-West demarcation line in Potsdamer Platz took on a special meaning; but squeezing your sweat-soaked body through a crowd of similarly sweak-soaked people in Central Hong Kong will never give you any sense of the past nor present of the place. And just next to Odeonplatz is the Residenz, where the anti-Nazi Wittelbachs. King Ludwig II built a number of castles and palaces around Bavaria, most notably the Schloss Neuschwannstein, located at a hilltop of the picturesque Alpine region, and served as the inspiration for Disney castles. Many people visiting München go to Neuschwannstein, but I didn’t, because I was too lazy to go on a two-hour journey to the castle and then another two-hour journey back to München. I remained in the city and went to Residenz, the palace of the Wittelbachs at the centre of the city, as well as Schloss Nymphenburg, the summer residence of the Wittelbachs, and where the current head of the Wittelbachs still live. They might not be as fairy tale-like as Schloss Neuschwannstein, but they were certainly no less magnificent. As was always the case, the reason to go to Europe, for me, is to listen to music. There are no better places for great orchestral and operatic performances than Europe, and Germany is the best of them all. München has one of the greatest orchestras in the world, Symphonieorchester des Bayerischen Rundfunks, or Bavarian Radio Symphony Orchestra, who jave had, among their chief conductors, Eugen Jochum and Rafael Kubelik, and they were one of the very few orchestras who had the fortune to have worked with the late, elusive Carlos Kleiber. Their musicianship today remains unsurpassed, and under the leadership of Latvian conductor Mariss Jansons, they have achieved a level of excellence, both technically and interpretively, so rare that even Berliner Philharmoniker have sometimes failed to achieve under the direction of Sir Simon Rattle. The only problem with München’s concert scene is the concert hall: by the standard of concert hall acoustics in Germany, Gasteig is probably one of halls with less-than-stellar sound, which doesn’t do any justice to the high performing standard of the orchestra. But despite the disappointing acoustics, the concert was a satisfying experience. It began with Brahms’ Violin Concerto, with Frank Peter Zimmerman as the soloist, and ended in the second half with Stravinsky’s lively and colourful bellet suite Petrouchka, which Mariss Jansons and the orchestra handled with brilliant virtuosity, precision, and excitement. A long time ago, I watched a documentary aired on BBC about the north face of the Eiger, an unclimbable four-thousand feet flat rock surface in the Alps. The image of the Eiger and the people who died trying to climb it reminded me of Richard Strauss’ eine Alpensinfonie, an epic symphonic poem that paints the picture of an Alpine adventure, from the early morning sunrise, the ascent, the glacier, the storm, to the end of the storm, sunset, and the peace returning to the night. I went to Marienplatz a number of times during my time in München, but I didn’t realise that I could go to the top of the Neues Rathaus to overlook the entire city (I could also go to the towers of the Frauenkirche and Peterskirche, but I didn’t) until a few days into my stay. The sky wasn’t as clear as the pervious two or three days, but I could still faintly make out, from a long distance, the contour of the Alps. All the tourists trapped in the narrow corridor of the tower of the Neues Rathaus were taking their time and quietly taking pictures. At that moment there nothing seem to happen, what I had in mind was the final two numbers of the Alpensinfonie. The sound of Berliner Philharmoniker playing it under the direction of Herbert von Karajan sounded in my mind; that rich sound of violins. 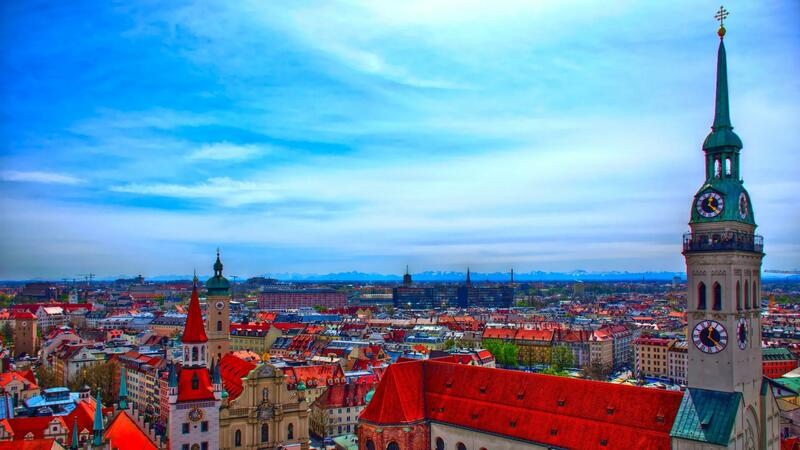 View from the top of Neues Rathaus, München. The Alps could be seen from there.